Tyler Magill stood up to Jason Kessler and had a stroke after being attacked by white nationalists. Meet the Charlottesville icon who stood up to Jason Kessler and had a stroke after being attacked by white nationalists. Tyler Magill chases Jason Kessler, memed. When “Unite the Right” rally organizer Jason Kessler approached the mic for a press conference on Sunday, Aug. 13, one day after an act of terrorism which he helped bring to Charlottesville, it was impossible to look away from the video feed. Some of the gathered locals at first reacted with a slow chorus of “shame.” Then some of these righteously angry got directly in Kessler’s face to tell him what they thought. Finally, a man approached, arms raised, and basically chased Kessler off the block, saying of the woman who was allegedly murdered in the name of Kessler’s alt-right protest the day before: “Her name was Heather. You have blood on your hands. You have blood on your hood.” The whole episode, unsurprisingly, went viral. This character might have seemed like something out of a Coen brothers movie: an autochthonous symbol of dread and vengeance, a golem from Charlottesville’s progressive heart, emerged with his hands raised to silence the outsider who had wreaked so much havoc. This was Tyler Magill, and it was actually the culmination of what had been a long weekend for one of Charlottesville’s most galvanizing cultural forces, a man who was dirtbag left before it was a thing. Tyler has haunted the Charlottesville scene for decades as a popular local DJ for the indie radio station WTJU, bridging the progressive mainstream to the freakier extremes of experimental and DIY culture in the rotating array of venues that has defined the local cultural landscape. Last week, he was admitted to the neurological ICU after a dissection in his carotid artery led to a stroke, leaving in peril one of the most important pieces of connective tissue in the local community. On Friday, Aug. 11, Tyler joined up with a small group that stood their ground in the face of the now infamous torchlight march. They were doused with oil, threatened with fire, and at some point, Tyler received a blow to the neck. On that Saturday, Tyler went about his weekend, witnessing an act of terrorism just a short distance from Low, the (literally) underground vintage store where he hawks the vinyl he scours the region for. On that Sunday, he had hoped to have a “staring at the wall kind of day” before he saw the notice that Kessler’s press conference was going to happen. With a “time to make the donuts” resignation, he went to have his now heavily memed confrontation with Kessler. On Monday, he once again became the Tyler Broadcasting System, delivering two hours of freeform programming with his usual élan, the same that inspired me when I first heard him DJ as the Velvet Facilitator on Charlottesville’s Radio Wowsville more than a decade again. On Tuesday, he had a stroke stemming apparently from the blow on Friday night. By Wednesday, a fundraising campaign to help support Tyler’s recovery had already surpassed its original goals twice as the figure closed in on $100,000 dollars, with about 8,600 shares. That evening, thousands of people marched in a candlelit vigil to take back UVA’s grounds after Friday’s tiki travesty. As the total approaches the new goal of $125,000, the string of irreverent commentary from contributors underscores the impact he has made on the community. Two primary reasons the hate groups that descended upon our small town chose Charlottesville is because of its progressive politics and its size. Even prior to this weekend, Tyler was an emblem for both. It is the modest size of a tertiary city like Charlottesville that gives rise to someone like the Velvet Facilitator. In a town with a transient student population—Charlottesville is currently in the midst of its August swell of student arrivals—Tyler is among a rare, smaller group of constants. 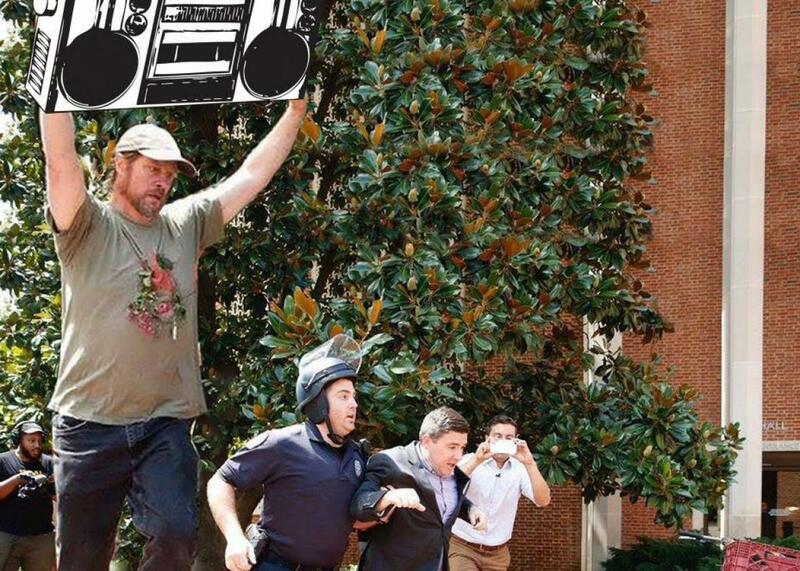 When protesters rallied at the University of Virginia lawn and Rotunda to stand in opposition to the Board of Visitors’ attempt to remove University President Teresa Sullivan in the summer of 2012, Tyler was the guy broadcasting directly from the lawn, interviewing students and professors, and offering an open microphone to the community. A couple of years earlier, he was the one who had galvanized a demoralized radio station to stand up to the prospect of a format change that would have drained the lifeblood from one of the great freeform radio stations in the country. (The author has volunteered as a rock DJ for WTJU for the last 12 years.) Ultimately, the station manager left, the Teej as it’s affectionately known was kept weird, and Tyler remained. Tyler’s varied careers speak to the layers of this city’s underground. The Corner Parking Lot—where he was once a parking attendant—like so many of the treasures of Charlottesville, looks like a normal business. But inside it is one of the town’s great islands of misfit intellectual toys. Meghan Eckman captured the worldview and esprit de corps of the attendants in her 2010 documentary The Parking Lot Movie. Within that documentary Tyler expressed an idea that I feel like captures the peculiar vibe of this college town. Yes, this is where town and gown gather, but that often comes with no small amount of friction. In their painful blandness, the the neo-fascists who advocate for a white ethnostate and who descended upon our town last week have no use for Tyler’s Charlottesville, which is what made his response to Kessler such an iconic moment of the weekend. The bland aesthetic stylings that the supremacists offer is a condensed symbol of the sheer flaccid ugliness of their future. The future that Tyler stood up for was the same culture he airs on the radio, makes with his band Grand Banks, promotes amongst friends, and helped bring to this town. It is a ragged piquant callaloo that hardly appeals to everyone: You may not be into it, but lots of people are happy to know there is a place in American culture where someone has the good sense to play Ornette Coleman after having played woodpecker sounds for minutes on end. So of course, Tyler was there to take the hateful blows of those who would destroy his culture among that of countless minority groups. But he will be back soon manning his outposts of the Small Army, the term he used to define Indie Charlottesville in the parking documentary and a fitting one in light of last week’s events. He will inspire many more and Charlottesville will continue to take shape in the bizarre fun house mirror he holds up. These were the things of life in a small town before last weekend’s invasion, and as Tyler returned to posting on Facebook about jai alai and John Fahey’s song for Christian fighters, they have already become again.